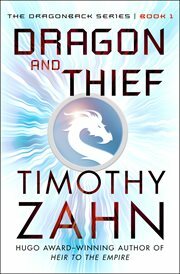 The item DRAGON AND THIEF;, (ebook) represents a specific, individual, material embodiment of a distinct intellectual or artistic creation found in Charlotte Mecklenburg Library. The first novel in the Dragonback series. Jack Morgan is dealing with more trouble than any young man deserves. Raised to be a professional thief and con artist by his late uncle Virgil, he's survived on his uncle's spaceship with the help of an AI program. But when he's accused of a crime he actually didn't commit, Jack is forced to flee to a remote, uninhabited planet where he can stay off the radar for a while. His solitude is soon interrupted when a ship crashes on Jack's hideout after a terrible space battle. There's only one survivor: a warrior called Draycos, whose reptilian race is being targeted for extinction. The good news is that if Jack helps Draycos, the odd creature might be able to help clear Jack's name. The not-so-good news is that to survive, Draycos must bond-physically and mentally-with a sentient being to use as his "host." And it looks like Jack is the only sentient being around . .